IAP participants navigate the river crossing practical application. During IAP, the MIT Army ROTC program contributed to the campus community by doing what we know best: leadership development. 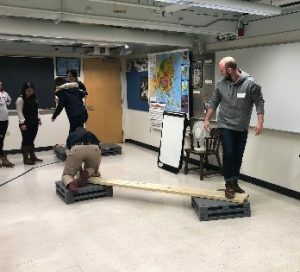 In late January, MIT Army ROTC faculty teamed up with MIT Sloan Business School’s Veteran Association to facilitate the Leadership Reaction Course (LRC), which is the culminating exercise for a three-day course called Leadership Lessons Learned from the Military. The LRC consisted of seven different scenarios designed to build leadership, teamwork, communication, and critical thinking skills. Over 60 MBA candidates completed the exercises testing the lessons developed during the first two days of the course. ROTC faculty also conducted a leadership development workshop for 11 members of the MIT community. Workshop participants spent two days exploring leadership concepts and skills including communication, presence, bases of power, and influence tactics. Finally, the program is pleased to announce that Captain Nadi Kassim, assistant professor of military science, was recognized as the ROTC Instructor of the Year, chosen from a pool of over 2,000 instructors across the United States. We congratulate him on his outstanding and well-deserved accomplishment. The faculty and staff of the Department of Military Science are excited about the upcoming semester, as we continue training the most talented young leaders in the nation. We look forward to continuing to fulfill our mission to host world-class leadership development training and education for our Army and for the MIT community. If you are interested in following MIT Army ROTC on social media, please check us out on Facebook @PaulRevereBattalion, on Instagram @mitarmyrotc, and on Twitter @mitarmyrotc.